I’ve been meaning to try out the recent addition to the Mozilla Webmaker tools, something called AppMaker, and Melissa Techman’s recent presentation at the K12Online Conference spurred me on. The AppMaker is designed to teach both simple and complex skills around designing an app, which can be viewed online and on mobile devices that run the new Firefox IOS. As with most Webmaker tools, there are remixable projects to start from, which I found handy. 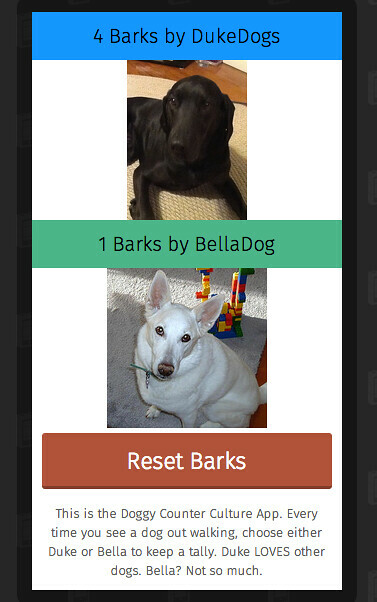 I used a Cat Counter, removed the cats, added my own dogs (current and deceased) and made the Dog Counter Culture app. I am thankful for this handy guide at Mozilla Webmaker, which had detailed instructions on how to remix the Cat Counter app. I just followed the directions, tinkered with the settings and it didn’t take me long to have an app. 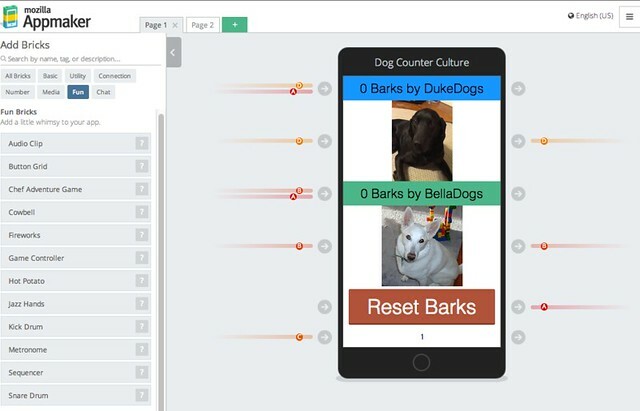 Here is the web version of the Dog Counter Culture app. (Yep, that’s me … barking like a dog). Here is the install link if you have the Firefox IOS. I don’t. But maybe I should try it out? I wonder, now, how I might pull this AppMaker into our Hour of Code activities in early December. What kind of apps could my students make and why would they make them? Need to get some brainstorming under way. If you have an idea, please drop me a comment. I’ll be asking my students, too. This entry was posted in Apps, TeachtheWeb. Bookmark the permalink. Now I want to try it!